I think I’m suffering from a blog identity crisis. Scratch that, it’s more like a general life identity crisis coupled with the feeling that I want to do more but I’m already doing too much. Is that even possible? I want to cook and bake every day, to swim, run, practice yoga, and lift weights. I want to take the dog for a long walk every day. I want to bring mountaineering back into my life but I love sailing multiple days a week. My job is awesome but I wish I could work more and do different things around the museum. Lee and I should really take that honeymoon we never had (one that does not involve the boat). We’re also excitedly planning our next trip to Pirat and where we might sail next. Until then, we really want to get somewhere on all our house projects! At some point, we want to have a family. I want to grow by blogs and share all my recipes, thoughts, and experiences with more people. I don’t really know how to accomplish this, though, and I don’t think I can do everything on my list. In an ideal world, I’d strategize and plan. Everything would fall into place. 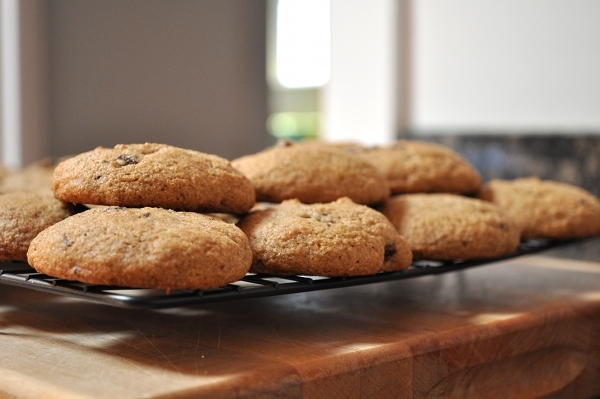 In an ideal world, I would bake these chocolate chip cookies every week until Lee and I were sick of them. This recipe came on a card in my Foodzie box from months ago. A small bag of Red Winter Wheat flour from Community Grains accompanied the recipe. I knew as soon as I looked through the box that I would be making these cookies. Somehow, though, the flour sat in my cupboard for months while I made other recipes. The time just wasn’t right for this one. Finally, last week, it was time for cookies. I needed that therapeutic routine of softening butter on the counter, getting out ingredients, measuring them into my grandmother’s mixer, and scooping dough into little balls. Watching that dough transform into perfect cookies in the oven was really just a bonus. I had already eaten enough of it off the mixer paddle to be satisfied. The dough was grainy – in a good way. 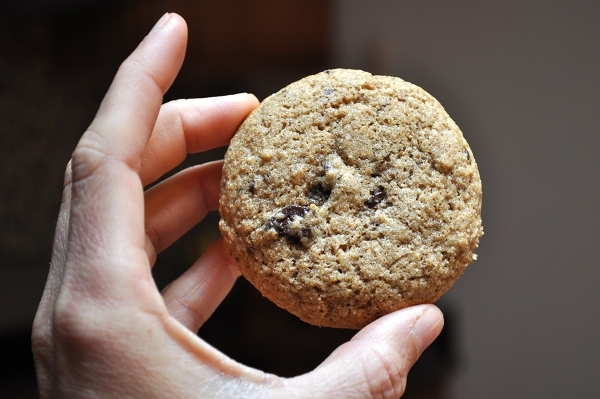 The cookies are just the right kind of chewy – not that kind that feels like a bite of mostly sugar and butter but the kind where you know you’re really sinking your teeth into something good. It’s almost like each little grain of winter wheat is in there crying out to be savored as a whole food and not just some vehicle for sweet-tooth satisfaction. I only make a couple of minute modifications to the original Community Grains recipe. I cut down the sugar a little bit and refrigerated the dough for a while before baking. I’ve read that this is a good thing to do (BraveTart know’s all about making a good chocolate chip cookie). 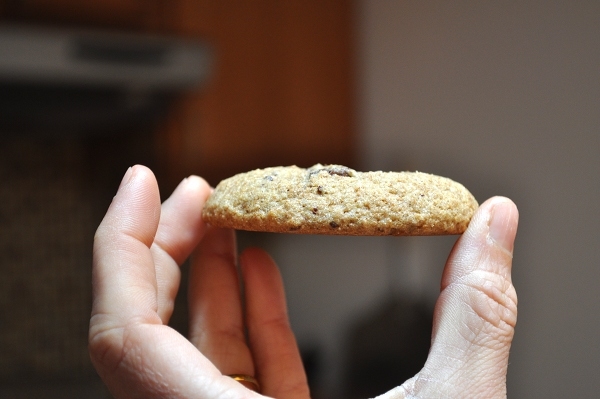 I love having perfectly round, thick cookies and chilling the dough makes a big difference! Make these. They will not disappoint. If you live in California and need some local winter wheat flour, I encourage you to check out Community Grains (or maybe you’re not local but you still want to try some of this fabulous flour). In an electric mixer, mix butter, sugars, and vanilla extract on medium-high speed until completely blended. Add dry ingredients to the mixer and mix until just incorporated. Add chocolate chunks, and, if using, toasted chopped walnuts. You can stir these in with a spatula or using the mixer on slow. If you have time, cover the bowl with plastic wrap and place it in the fridge for at least half an hour (but the longer the better). When you're ready to bake, preheat the oven to 350 degrees F.
Line a cookie sheet or two with parchment or a Silpat. Spoon walnut-sized portions of dough onto the cookie sheets, about 2 inches apart. Bake for 12-15 minutes or until the edges of the cookies are golden. 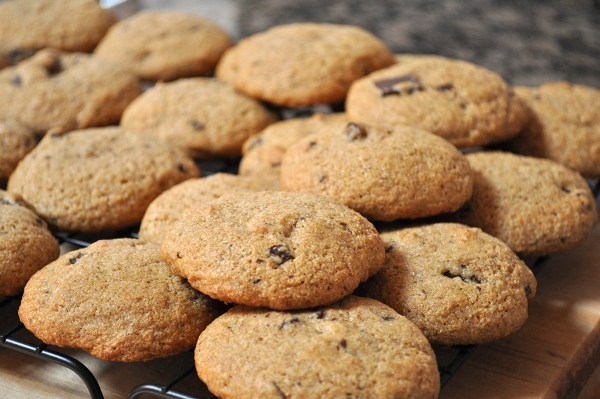 Remove cookies from the oven and let them cool for a minute on the pan before transferring them to a wire rack.